Medical student at the University of British Columbia in Vancouver. Biostatistician in the Women’s Health Research Institute at the BC Women’s Hospital and Health Centre in Vancouver. Family physician researcher, Associate Professor, and Director of the Clinician Scholar Program in the Department of Family Practice at the University of British Columbia. Objective To examine characteristics at admission and subsequent academic achievements among the graduates of the first 15 years of the clinician scholar program (CSP), Canada’s longest-running such program, housed at the University of British Columbia in Vancouver. Design Cross-sectional study with data gathered from program files, personal correspondence, and public sources. Participants Graduates of the University of British Columbia CSP from 2001 to 2015. Main outcome measures Characteristics at admission (years since medical school graduation, previous graduate degrees) and measures of scholarly success (peer-reviewed publications, subsequent graduate degrees, and academic faculty appointments). Results We obtained data for all 40 CSP graduates. The median years since medical school graduation at admission to the CSP was 12 years (interquartile range of 8 to 19); 60% of entrants held no previous graduate degree. After CSP completion, 15% of graduates attained an academic faculty appointment and 23% published more than 2 peer-reviewed articles per year. Subsequent success was not diminished with increasing years since medical school graduation, nor was it diminished among those without a previous graduate degree. Clinician scholar program graduates who subsequently completed a graduate degree were significantly more likely (P = .01) to publish frequently. We noted a weak negative relationship between getting a subsequent degree and number of years since medical school graduation (odds ratio of 0.89, 95% CI 0.78 to 0.99, P = .04). Conclusion We found family physicians interested in becoming researchers were usually highly experienced, with physicians entering the CSP a median of 12 years (interquartile range 8 to 19 years) after medical school graduation. Most went on to publish several papers and more than 20% maintained a productivity of more than 2 peer-reviewed papers per year. The mentorship program model during this first 15 years has been effective in training family physicians to begin clinician scholar careers, and has been built upon, with the introduction from 2013 to 2015 of an enhanced curriculum. Future quantitative and qualitative analysis of this program and others is important to better articulate the success of clinician scholars striving to understand and improve primary care and health for Canadians. In 1999 the University of British Columbia (UBC) began the first such program in Canada as a “clinician investigator” program. It initially mirrored similar programs for the Royal College of Physicians and Surgeons of Canada specialties and later became Canada’s first CSP in 2009, with the official CSP launch by the CFPC. Physicians admitted into the 2-year, half-time program are mentored by a Department of Family Practice faculty member to formulate a scholarly question and then answer it using their formulated methodology. In this study, we aimed to identify the characteristics at admission of family physicians accepted into the UBC CSP during the first 15 program years (including demographic characteristics, previous research training, and duration of practice) and to describe and correlate these with measures of academic success (publications, grants, and faculty roles) after graduation. We conducted a retrospective cohort study using data on scholar characteristics and outcomes from program records, public sources, and correspondence with graduates. We were granted ethics approval by the UBC Children’s and Women’s Research Ethics Board for research involving human subjects. We included data on all graduates of the UBC CSP from 2001 (with the program start in 1999) to July 2015. There were no exclusion criteria. We contacted graduates via e-mail to introduce the study and to request a copy of their current curriculum vitae. We also sought information through directories of the college of physicians and surgeons in each of their provinces of practice or through public sources, including the websites of Canadian departments of family practice or equivalent faculties of medicine, the CFPC, the Canadian Institutes of Health Research, the Social Sciences and Humanities Research Council, PubMed, and Google Scholar. For analysis, we categorized graduates into 3 cohorts based on their year of graduation (2001 to 2005, 2006 to 2011, and 2012 to 2015) and calculated rates of output per year since graduation. We used descriptive statistics to summarize demographic and educational characteristics. 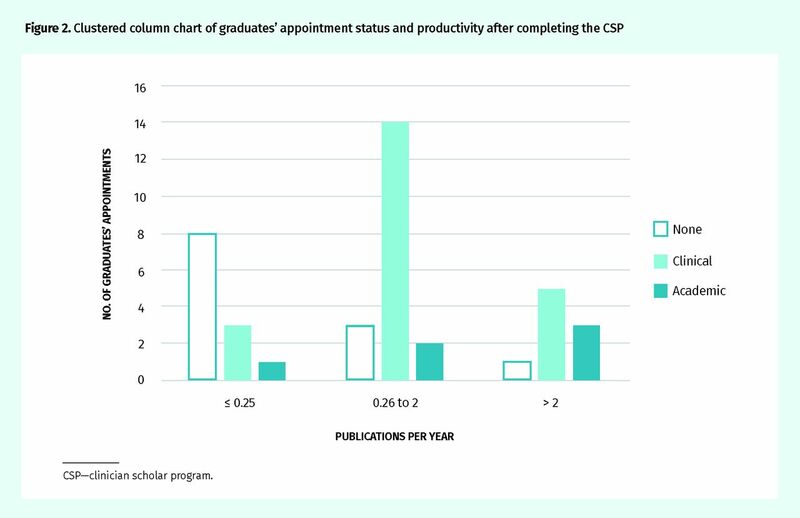 Next, 4 metrics of successful graduate output were used for analysis: publication rate (mean number of publications per year after completing the CSP), grant rate (number of grants obtained per year after completing the CSP), any graduate degrees attained after completing the CSP, and any academic appointments held after completing the CSP. To look for characteristics at admission that could be correlates of success, we examined the number of years between medical school completion and CSP entry, and the number of graduate degrees attained before CSP entry. We used Spearman rank correlations to look for relationships between publication rate and grant rate and number of years between medical school graduation and CSP entry. Logistic regression was used to test for a relationship between the odds of getting a subsequent degree and the years between medical school graduation and CSP entry. We compared publication rate and grant rate among cohorts using a Kruskal-Wallis test, and the proportion of subsequent degrees among cohorts using a Fisher exact test. We compared publication and grant rates between those with differing numbers of degrees before CSP entry using Wilcoxon rank sum tests, and compared the proportion that got subsequent degrees using a Fisher exact test. As a further exploratory analysis, we divided graduates into groups based on the rate at which they published since completing the CSP by dividing the total number of peer-reviewed publications by the number of years since completing the CSP. We defined 3 groups: 0 to 0.25 publications per year, 0.26 to 2 publications per year, and more than 2 publications per year. We then compared the proportion of people among these groups who had 2 degrees at CSP entry, subsequently obtained graduate degrees, or subsequently held faculty appointments using the Fisher exact test. We obtained curriculum vitae and public-source data for results variables on 100% of all 40 UBC CSP graduates from 2001 to 2015. Most graduates (60%) did not hold a graduate degree before CSP entry; however, 30% and 10% held 1 and 2 previous graduate degrees, respectively (Table 1). Analysis of output variables indicated that 25% of graduates attained at least 1 graduate degree after completing the CSP and 15% subsequently held an academic appointment. 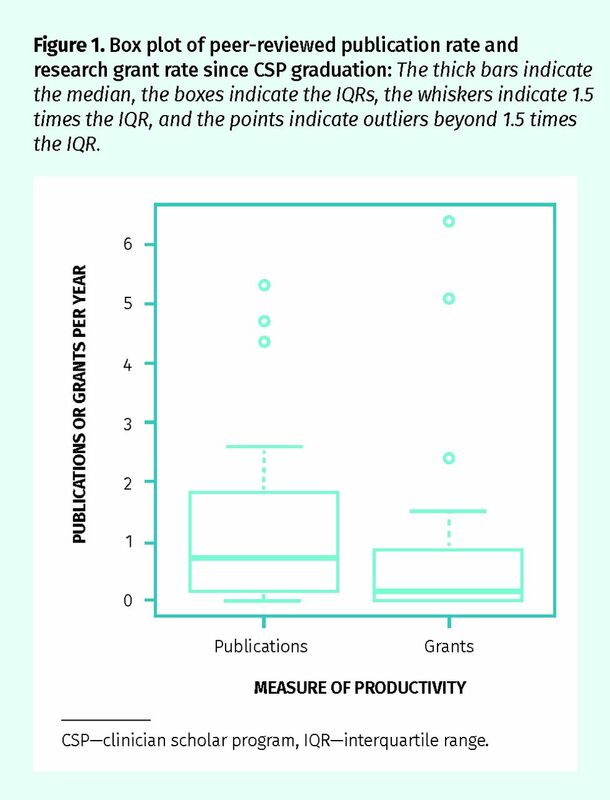 In terms of peer-reviewed publications and receipt of research grants, we found a range in productivity (from 0 to 64 and from 0 to 61, respectively), as outlined in Table 2. We found no significant difference among the cohorts with respect to either publication rate (P = .30) or grant rate (P = .82) overall. There was also no significant difference among the cohorts in the proportion of scholars who attained a subsequent degree (P = .09). Overall, we found no significant relationship between years between medical school graduation and CSP entry and annual publication rate (ρ = 0.01, P = .97) or grant rate (ρ = 0.06, P = .72). There were 3 very large outliers in annual publication rate (4.7, 5.3, and 4.4) and annual grant rate (5.1, 2.4, and 6.4) (Figure 1). Even when these outliers were excluded, we still found no significant relationship between years between medical school graduation and CSP entry and either publication rate or grant rate. We did find a weak negative relationship between the odds of getting a subsequent degree and the number of years between medical school graduation and CSP entry (odds ratio of 0.89, 95% CI 0.78 to 0.99, P = .04). Box plot of peer-reviewed publication rate and research grant rate since CSP graduation: The thick bars indicate the median, the boxes indicate the IQRs, the whiskers indicate 1.5 times the IQR, and the points indicate outliers beyond 1.5 times the IQR. CSP—clinician scholar program, IQR—interquartile range. We found no significant relationship between the number of graduate degrees attained before CSP entry (1 vs 2) and publication rate (P = .09) or grant rate (P = .17) per year since CSP completion. Similarly, there was no difference among those with and without previous degrees in the proportion of scholars getting subsequent degrees (P > .99). In fact, the proportions were identical in both groups, with 25% of scholars with no degrees and 25% of scholars with 2 degrees completing a subsequent degree. We examined categories for the publication rate after CSP completion of 0 to 0.25 publications per year, 0.26 to 2 publications per year, and more than 2 publications per year; there were 12, 19, and 9 graduates in each category, respectively. We found no significant difference between groups in the proportion of graduates who had 2 degrees before entry (P = .15). However, we did find a significant difference in the proportion who attained another graduate degree after completing the CSP (P = .01): 5 (56%) of the more than 2 publications per year group, 5 (26%) of the 0.26 to 2 per year group, and 0 (0%) of the 0 to 0.25 per year group. Of the 5 graduates in the more than 2 publications per year group, 4 completed doctoral degrees and 1 completed a master’s degree. Of the 4 in the more than 2 publications per year group who did not go on to complete another degree, 2 had obtained a master’s degree before starting the CSP. There were 3 scholars with more than 4 publications per year. Two of these graduates subsequently completed doctoral degrees while the third did not, but had recently enrolled in a doctoral program at the time of this analysis. Three of the graduates in the more than 2 publications per year group were also in the 0 to 5 total publications category, having only published 5, 2, and 2 papers since completing the CSP in 2014, 2015, and 2015, respectively. Two of these 3 enrolled in doctoral programs, and the other enrolled in a master’s degree program. We also found a significant difference in the proportion of graduates with academic faculty appointments after completing the CSP and the categorical number of papers per year (P = .01). As shown in Figure 2, more graduates in the lowest publication rate category had no academic appointments, while those in the higher productivity groups had higher rates of both clinical and academic appointments. We present the first report on outcomes of a Canadian family physician research training program and the first report describing characteristics at admission related to success after completion of the CSP at UBC. We found that graduates were highly experienced at CSP entry, with a median of 12 years (interquartile range 8 to 19 years) since their medical school graduation, were more often women (65%), and usually had no previous graduate degree (60%). We found no correlates among admission characteristics for postprogram research success. However, most graduates had several publications, and 20% maintained a publication rate of more than 2 peer-reviewed articles per year; these graduates more frequently completed a postgraduate degree after the CSP. We found 15% of CSP graduates subsequently attained an academic appointment. As the ratio of academic faculty appointments to number of practising Canadian physicians is lower for family medicine than any other specialty, this finding might indicate a positive influence of CSP training on those interested in pursuing an academic career. Further research would be required to better understand the relationship between these factors. In general, lower engagement of family physicians in academia has been noted to be partly owing to fewer available departmental research positions and a greater demand for clinical teachers.15 Our findings mirrored this, as 55% of graduates held clinical appointments after completing the CSP, 5 of whom were highly productive. This result might not accurately reflect research support received by these graduates, as clinical appointments are less likely to provide protected research time. We found that for every single-year increase between medical school graduation and CSP entry, the odds of completing a subsequent graduate degree decreased by 11%. We speculate this might be owing either directly to age or to greater career establishment. Our study was not designed to identify these influences; however, qualitative analyses have found time constraints, fidelity to clinical practice, and family life are viewed as substantial barriers to developing a research career.19 These factors, as well as a CSP curriculum during the time period in question that was nearly exclusively based on individual mentorship, might also contribute to our finding that almost one-third of graduates had low subsequent research productivity. With that said, in contrast to programs in Ontario where funding restrictions often limit admission to very recent family medicine graduates, the CSP at UBC found successful applicants were highly experienced, with a median of more than a decade in practice. Although our model did not find a correlation between postprogram productivity and years from graduation, there were almost no entrants directly from previous training to allow this bivariate comparison. Understanding postprogram achievements between these 2 admission criteria models would be an interesting comparison for future research. We have shown that the CSP at UBC has been successful thus far in training engaged and productive clinician scholars. From 1999 to 2013 the program was structured as a learner-driven model based upon individual engagement with a faculty mentor with 1 peer progress report monthly via telephone. Beginning in 2013 (and fully implemented from July 2015) a structured curriculum was gradually added to the central individual scholarly project mentored by an individual faculty member. The curriculum included weekly virtual seminars building clinician scholarship skills, regular peer and departmental presentations of works in progress, increased academic deliverables and scholarly exercises (eg, manuscript peer review), and a quarterly academic day or retreat. Further research will be required to compare the effectiveness of the 2 program models. Mandatory individual mentorship, which is part of both versions of the program at UBC, has been the key component of many other research training programs for physicians and has contributed to increased graduate success.10,15,19–22 Specifically, having a sustained mentor has been shown to positively influence clinicians’ research careers through navigation of academia and development of personal characteristics associated with research success.21,22 Given a positive relationship between the mentee and the mentor, mentees might also be more likely to become mentors in their future careers.21,22 We hope that future analyses of the new program might identify increased research engagement and success in graduates’ careers. Limitations of this study include partial reliance on public sources for information on publications and underestimation of success by measuring grants and academic faculty appointments, thus biasing our results toward the null. Further, we were unable to identify an appropriate control group or literature example describing a similar population as a comparable baseline for success. Also, our evaluation did not analyze or control for the proportion of time each graduate has available to spend, or actually spends, engaging in research compared with clinical practice or other realms of scholarship (eg, community engagement, pedagogy). The limited availability of funding that could protect dedicated research time is an important factor and a very likely cause of the range in research productivity since graduation from the program. A strength of this study is the 15-year timeline from which data could be collected and the ability to collect data from public sources for all graduates. Currently, UBC has the longest-running CSP of the 7 active or potential programs in Canada. This analysis of the program has shown that it has been effective in training family physicians to begin as clinician scholars with successful research careers. Important future evaluations on this and other Canadian CSPs could include qualitative analyses reporting the effectiveness of different program approaches and quantitative analyses comparing or combining CSPs over time to identify trends and correlates for the success of graduates. These future analyses will be helpful in improving and implementing training programs that support family physicians to continuously identify and address key family medicine knowledge gaps in our quest to achieve better health for Canadians. ▸ Clinician scholar programs (CSPs) aim to develop the competencies practising family physicians require to begin a scholarly career. This study is the first to report on outcomes of a Canadian family physician research training program and the first to describe characteristics at admission related to success after completion of the CSP at the University of British Columbia. ▸ Graduates were highly experienced at CSP entry, with a median of 12 years (interquartile range 8 to 19 years) since their medical school graduation; were more often women (65%); and usually had no previous graduate degree (60%). No correlates among admission characteristics were found for research success after CSP completion. However, most graduates had several publications, and 20% maintained a publication rate of more than 2 peer-reviewed articles per year; these graduates more frequently completed a postgraduate degree after the CSP. ▸ A total of 15% of CSP graduates subsequently attained an academic appointment, and 55% of graduates held clinical appointments after completing the CSP, 5 of whom were highly productive in terms of peer-reviewed publications. ▸ Les programmes de bourses de recherche clinique (PBRC) ont pour but de développer les compétences dont un médecin de famille en pratique a besoin pour commencer une carrière de chercheur. Cette étude est la première à décrire les résultats d’un programme canadien de formation en recherche à l’intention de médecins de famille, la première aussi à décrire les caractéristiques qui, lors de l’admission dans le programme, favorisent le succès des diplômés de ce programme à l’Université de la Colombie-Britannique. ▸ Les diplômés du programme avaient déjà beaucoup d’expérience à leur début dans le PBRC, avec une médiane de 12 ans d’expérience (écart interquartile de 8 à 19 ans) depuis la fin de leur cours de médecine; c’était le plus souvent des femmes (65 %); et, en général, ils n’avaient obtenu aucun diplôme d’études supérieures auparavant (60 %). On n’a trouvé aucune corrélation entre les caractéristiques initiales des boursiers et leur succès en recherche après avoir complété le PBRC. Toutefois, la plupart des diplômés avaient plusieurs publications, 20 % d’entre eux maintenant un taux annuel de plus de 2 articles révisés par des pairs; ces derniers ont plus souvent obtenu un diplôme de troisième cycle après le PBRC. ▸ Au total, 15 % des diplômés ont par la suite obtenu un poste universitaire et 55 % d’entre eux ont accédé à un poste clinique après avoir terminé le PBRC, parmi lesquels 5 boursiers ont été très productifs en termes de publications révisées par des pairs. The idea for this study was developed by Dr Norman, the data collection was conducted by Ms Workman, the analysis was conducted by Dr Albert, and the first draft of the manuscript was completed by Ms Workman. All authors contributed to revisions, accepted the final version of the manuscript, and agreed to act as guarantors of the work. Dr Norman has been the Director of the Clinician Scholar Program in the Department of Family Practice at the University of British Columbia since 2013.
. Family medicine in 2018. Can Fam Physician 2010;56:313-5. (Eng), 316–9 (Fr).
. Ecology of family physicians’ research engagement. Can Fam Physician 2016;62:385-7. 389–90 (Eng), e231–5 (Fr).
. Primary care in the health care system. In: Jaakkimainen L, Upshur REG, Klein-Geltink JE, Leong A, Maaten S, Schultz SE, et al., editors. Primary care in Ontario: ICES atlas. Toronto, ON: ICES; 2006. p. 1-14.
. Manifesto for family medicine educational research. Can Fam Physician 2015;61:745-7. (Eng), e398–400 (Fr).
. Health professionals for a new century: transforming education to strengthen health systems in an interdependent world. Lancet 2010;376(9756):1923-58. Epub 2010 Nov 26.
. Research in family/general practice is essential for improving health globally. Ann Fam Med 2004;2(Suppl 2):S2-4.
. Ten most notable family medicine research studies in Canada. Can Fam Physician 2015;61:523-7.
. CFPC celebrates top 20 pioneers of family medicine research in Canada [news release]. Mississauga, ON: College of Family Physicians of Canada; 2015. Available from: www.cfpc.ca/ProjectAssets/Templates/NewsItem.aspx?id=8072. Accessed 2017 Jun 10.
. Do you have a secret researcher inside? High-quality family medicine research at Family Medicine Forum. Can Fam Physician 2014;60:602-4. (Eng), 608–10 (Fr).
. Clinician investigator training in Canada: a review. Clin Invest Med 2011;34(4):E192.
. Clinician-scientists in Canada: barriers to career entry and progress. PLoS One 2010;5(10):e13168.
. Survival of clinician scientists. Clin Invest Med 1997;20(4):283-8.
. The rising challenge of training physician-scientists: recommendations from a Canadian national consensus conference. Acad Med 2018;93(2):172-8.
. Family medicine research capacity building. Five-weekend programs in Ontario. Can Fam Physician 2010;56:e94-100. Available from: www.cfp.ca/content/cfp/56/3/e94.full.pdf. Accessed 2018 Nov 27.
. Building capacity for research in family medicine: is the blueprint faulty? Fam Med 2003;35(2):124-30.
. Specific standards for family medicine residency programs accredited by the College of Family Physicians of Canada. The red book. Mississauga, ON: College of Family Physicians of Canada; 2016. College of Family Physicians of Canada; p. 55.
. Clinician scientists in Canada: supporting innovations in patient care through research. Ottawa, ON: Royal College of Physicians and Surgeons of Canada; 2016. Available from: www.royalcollege.ca/rcsite/education-strategy-accreditation/innovations-development/initiatives/clinician-scientist-e. Accessed 2018 Nov 29.
. Scholarship reconsidered. Priorities of the professoriate. New York, NY: John Wiley and Sons; 1990.
. The research productivity of Canadian physicians: how the timing of obtaining a PhD has an influence. Acad Med 2007;82(3):310-5.
. Fostering excellence. Roles, responsibilities, and expectations of new family physician clinician investigators. Can Fam Physician 2014;60:e105-12. Available from: www.cfp.ca/content/cfp/60/2/e105.full.pdf. Accessed 2018 Nov 27.
. Issues in the mentor-mentee relationship in academic medicine: a qualitative study. Acad Med 2009;84(1):135-9.
. Assessing the role of influential mentors in the research development of primary care fellows. Acad Med 2004;79(9):865-72.